Celebrity vet Marc Abraham has called for a ban on wild animals in circuses in the UK after seeing how the lives of the animals from the last circus big cat act in Britain are “severely compromised”. Although the circus season is over, ADI has documented that the show must go on for the lions and tigers owned by Thomas Chipperfield who continue to be put on display during the winter months on the exposed north east coast of Scotland. Confined most of the time to the back of the truck, the animals display behaviour that shows they are not coping with their restricted, unnatural environment. 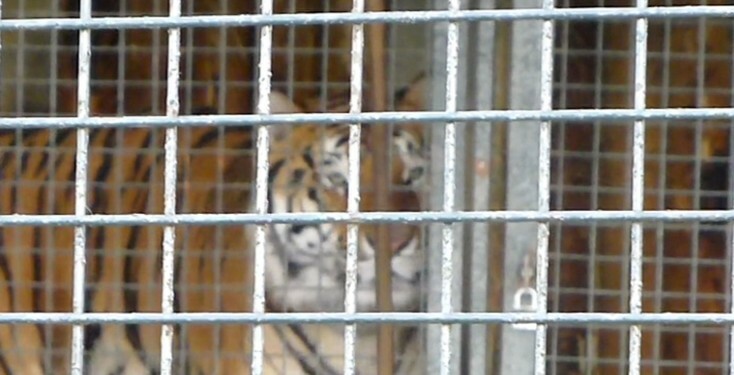 Footage filmed by ADI at the big cats’ location in Fraserburgh, Aberdeenshire, shows one of the three tigers pacing back and forth inside the ‘beastwagon’, made up of caged compartments in which the animals both live and are transported. This pacing is an abnormal, repetitive ‘stereotypic’ behaviour which is not seen in the wild, but is commonly observed in circuses, and indicates compromised welfare. ADI documented similar scenes whilst the animals performed with Peter Jolly’s Circus earlier in the year, when wildlife vet Simon Adams and UNEP conservationist and former MEP Stanley Johnson voiced similar concerns. Simon Adams stated “the limited space available in a travelling circus is unsuitable to big cats”, and Stanley Johnson called for a ban on the “degrading and incredibly damaging” use of wild animals in British circuses. The lives that the Chipperfield tigers endure in the circus are in stark contrast to the lives they would have in the wild. Given their solitary nature, tigers have limited contact with other tigers in the wild, and roam and defend their territory which can be as large as 470 km2. In the circus, they are forced to live caged inside their ‘beastwagon’ in close proximity to one another and alongside lions, who they would not encounter in the wild. Although an outdoor enclosure is provided, the big cats have limited access. As vet Marc Abraham states, and ADI investigations show time and again, wild animals in circuses suffer. The public has already turned its back on such acts and now it is time for the government to play catch up and end circus suffering and bring in a ban without delay. The Chipperfield big cats are the first wild circus animals to be seen in Scotland for several years, and their arrival has caused Aberdeen MSP Kevin Stewart to table a motion calling on Scotland to ban such acts which has cross-party support. Early this year, the Scottish Government conducted a public consultation on the issue, to which a response is expected in the New Year. In Britain, the Government states it remains committed to banning the use of wild animals in circuses but little progress has been made since the measure was announced in 2012, leading Jim Fitzpatrick MP to introduce a Bill which enjoys cross-party support but continues to be blocked by just three Conservative MPs. It will have a second reading on 5th December. Help stop circus suffering in the UK! It’s way past the time this should be stopped so stop it please. These animals deserve a good life. There is no need for animal circuses in the 21st century. End them now and send the animals to live out their days in a sanctuary. PLEASE ban wild animals from the horrible life of a circus performer with no rights and abominable living conditions. The circus is no place for a wild animal. Come on UK let us get this Bill passed and abolish use of animals in circus. Please stop this unnecessary cruelty. Please ban the circus. These Tiger’s deserve to live in a sanctuary, not a prison where they get beaten to perform. Thank you! This disgusting practice MUST end, how can be claim to be a nation of animal lovers when this goes on ! Show your own humanity, boycott this disgraceful circus ! Animals are not born to be entertainment. Countries far less developed than ours have banned this cruelty, if the government cannot see how wrong this is to keep wild animals caged up and cruelly treat for “entertainment purposes”. They don’t have a voice but their behaviour that has been observed speaks volumes. It’s not natural or humane. These animals are suffering daily, physically, mentally and probably emotionally I’m sure they are confused and frightened. These animals need to be FREE !!! animals should be taken care of and rescued and should be let live in their natural habitat safely and happily. When you mix money and animals, the animals always lose. you sound like you already know what you’re speaking about!